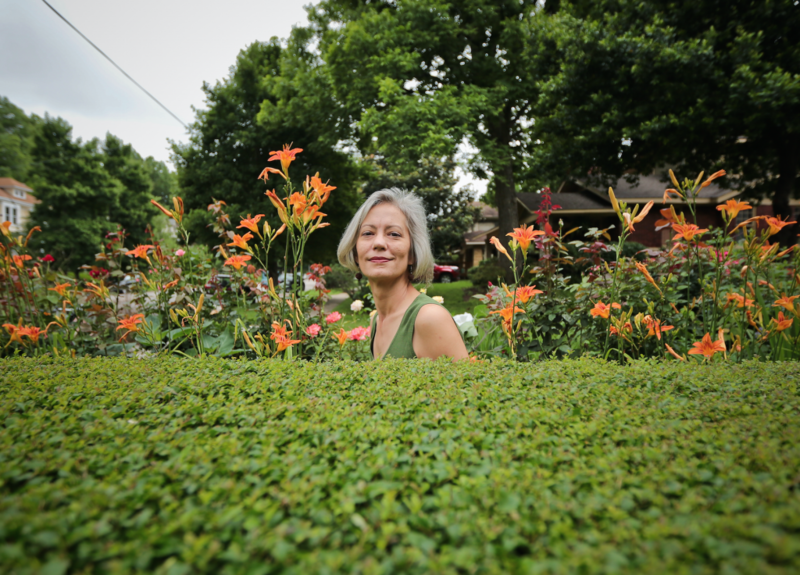 Three-time ioby Leader Robyn Mace raised the money, buy-in, and helping hands needed to convert a neglected lot adjacent to her family’s Memphis home into the stormwater-thirsty Evergreen Rain Garden. Why did you want to use green infrastructure in your neighborhood? I’d seen flooding at the site and knew it was a problem. I wanted to do something to help, but didn’t want to have to water or maintain the area like you would a lawn. I also thought it would be a great place to propagate some native plants, and that it could serve as a demonstration site to show other homeowners that they can do something to reduce runaway stormwater runoff, too. How did you get the word out and gain support for the rain garden? I relied on two pretty strong neighborhood associations: the Evergreen Historic District Association and the Evergreen Garden Association. Both were great for building awareness and helping to raise funds. I had also been petitioning to get the sidewalks around the lot fixed, which put me in touch with some good people. Lastly, I actually went door to door and talked to my neighbors. I am not a social media maven, but I’m sure the process would have gone even faster if I were! Can you share any tips for working with decision makers? Develop an “elevator pitch” for your idea [a quick summary you can relate quickly and casually—like during an elevator ride], and practice it. Also have a written summary ready—with illustrations if possible—that you can immediately send to anyone. Both of these efforts demonstrate that you’ve thought things through and come prepared. Try to figure out who might get involved as early as possible and reach out to them: an area gardening organization, your local representatives, the city’s environmental or sanitation department, etc. Make yourself available to answer questions. And ask questions! Everybody I spoke with got on board with this idea pretty quickly, even if they didn’t have money to support it. That kept us going during moments when we thought it might not happen. What were the benefits of the garden? Did they go beyond environmental ones? Absolutely. In terms of community, we got to know neighbors from blocks away—sometimes even ten or twelve blocks away! In all we had close to 20 people come out to help build it. Some donors gave money to one of the local associations to help; some just slipped a $10 or $20 bill into a volunteer’s pocket! The area now looks healthy and maintained, which gives people a positive impression of open space, rather than thinking, “Why is there that unkempt empty space here?” Parents come by with their kids and check out the flowers. That’s always fun to see. Environmentally, I have seen the garden fill with rain and still pull rainwater off the concrete pad it sits next to—which was the point! Does it make a big impact on our greater water management system by itself? No; it holds maybe 200 or 300 gallons in a big storm. But for what it was supposed to be, it’s absolutely worked. And I have heard from other people and groups in the city that they’re trying out their own green infrastructure projects after seeing this one, so I’m glad to see it working on the demonstration level, too. What should residents know or do before embarking on their own green infrastructure project? Find out everything you can about the location you’re selecting. Learn who owns the property and its previous uses; do a search for news stories about it; see if there’s any infrastructure like gas lines under it. If you see city crews working on it, go ask them what they’re doing! Research some good precedents for the kind of project you want to do so you can be confident it will work—and you can illustrate that to other people. Go into it with the mindset that you’re willing to put elbow grease into a crummy place and make it better: why wouldn’t people want to help you do that?! But also be flexible and open to new ideas. Don’t assume that anyone, including you, has all the answers. Remember that advocates can come from unlikely places. Be prepared to regroup and persevere after the inevitable setbacks. Think long-term about your project’s maintenance needs and do your best to prepare for them to be met. Never hesitate to share your good ideas: the goal is to spread the positive impacts, not get an award for best idea. Lastly, keep at it! When your project starts to work, it’s really awesome.